In October 2002 the authorities of the Sacred Heart Seminary (Victoria, Gozo) contacted Robert Buhagiar expressing their wish to acquire a new organ to replace the old reed organ which no longer met the musical requirements of the Seminary Chapel. The options were two : either a digital organ or a small pipe organ. After some consideration it was decided that the latter was a better artistic and financial investment. The contained dimensions of the Chapel required the organ to be as compact as possible and its casework would have to integrate as much as possible with the dark mahogany pews. 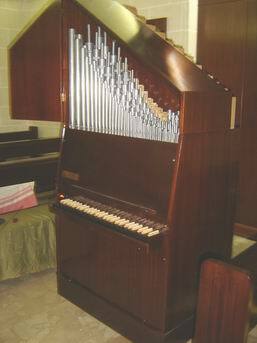 The budget available was too low for considering a new custom-built organ so a search was initiated for a second-hand instrument. This proved fruitful and in March 2004 R.Buhagiar travelled to Germany to inspect and eventually buy the organ. Transported to Malta, the organ was dismantled to verify all the components while the case was completely overhauled and given a dark mahogany shellac finish. Installation was scheduled for November and the organ was ready for use by Advent 2004. The flutes are full of charm and character while the Prinzipal 2' lends brilliance and effectively leads a full congregation. The case is fitted with panels which when shut enclose the pipework like in a swell box. This produces an effective pianissimo which is most welcome when the organ is employed to accompany Gregorian Chant.